Nira Banez, Director of Our Caring Way in Falls Church, Virginia, jumped in with both feet and switched over to a full family style dining practice in March 2018, just after she received a family style dining kit through her participation in the Early Care and Education Learning Collaborative (ECELC) program. 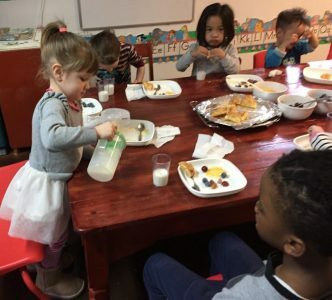 In just two weeks of using the kit, Nira was fascinated with the way the children were serving themselves and having polite conversations with each other. Nira was also impressed with the older children taking pride in being able to help the younger children. Prior to enrolling in ECELC program, staff at C.A.R.E. for Me Children’s Learning Center in New Jersey neither monitored the food children brought from home nor did they promote family style meals. The food many parents were providing were unhealthy and it was quite difficult to change this common practice. Now the center no longer permits sugary drinks or sweets to be served to their children. Better Kid Care, through PennState Extension, provides a list of tools and information about family style dining. Resources include off-the-shelf curricula and toolkits, videos, tip sheets, and information on family engagement.